Here's the latest on the gig bag. Two weeks ago I took the train North to Accrington to spend the afternoon with Dave Taylor. Dave owns Stirling Mouldings a great company combining thermoforming and stitching processes (web site redeveloping so don't look for it). Stirling are at the cutting edge of body protection for football and rugby players - they know a ton about impact resistance and shock absorbtion. 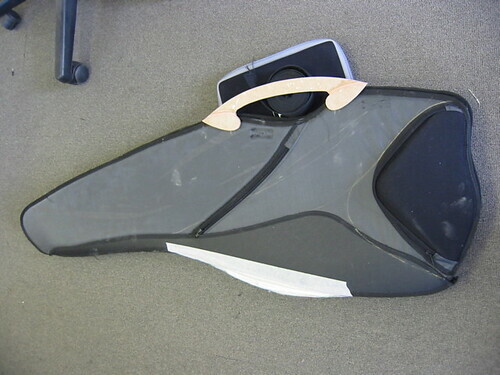 Dave had made us a first prototype using closed cell foam Alveon and semi-rigid plastic. 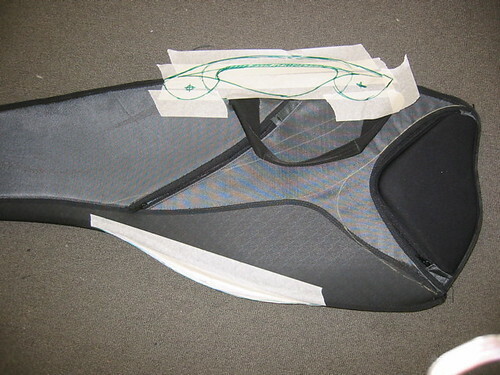 The closed cell gives way more protection than the open cell used in most other gig bags. 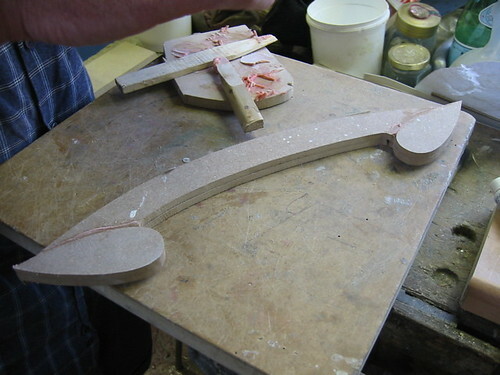 The chassis (which in the production version will be CURV) gives extra support to the neck and base of a guitar. The 5 hour train trip was so that I could discuss next steps. A week later Dave shipped this model to me (made of wood - seriously heavy) showing the general contours of the thermoformed bag. Not right - but I liked the way it was going. From above you can see the streamlined look we're working on - cool and very strong. To get the details of the design right I asked designer Michael Mailling to come over and he got down to it - smoothing out the contours of bag and reworking the external pocket and handle design. Here's the final drawing he send to Dave (the handle needs more work - something more skeletal). I arrived in Frankfurt expecting a bunch of firm offers from potential distributors. Our prototypes had been well received - now it was time for these guys to show me they were serious about selling Calder Cases to dealers. We'd had one firm proposal from top rank UK distributor but I needed big orders from the US to make the business plan work. After 3 days of this I was a weary worried guy. To be competitive in the mainstream bag/case market distributors were interested in I'd have to go for high volume manufacture in China. This meant laying out big bucks - fine if I had some firm orders from distributors - but I had none. Headed for the airport heavy hearted - checking out the newstand bought ID - The International Design Magazine. 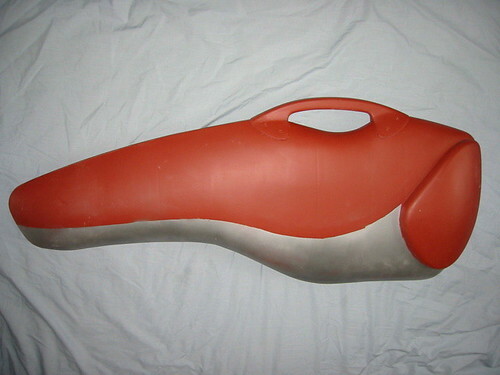 Struck by the number of features on innovative products being sold direct to customers over the web. In a heartbeat I had a new plan. Forget distributors and dealers with all the baggage of low prices/high margins/volumes/full range of product/point of sale material/huge marketing budgets. No the way to go was straight to the consumer through the web. Make a truly brilliant product in the UK/USA, make to the highest standards and not down to a price. Scribbled numbers furiously all the way to Heathrow - they looked good. Came home buzzing - checked out the new plan with my group of friends/associates - they all said 'go for it'. Of course I'd spent a ton of money and time building relationships with potential distributors - was that all wasted? In the end I think not - I had learnt a huge amount about the industry, met some very cool people and received much wisdom from them. My new course was radical but also informed. What turned me on most was that I could make the cases and bags that I had originally dreamt of - ok the market would be small but I would making products I believed in. And I would be communicating directly with end users much more satisfying than going through a chain of middle men. Be prepared to make radical alterations to your business plan. Starting small with maximum control over your spending may be a more secure route to market.